Congratulations on your book. 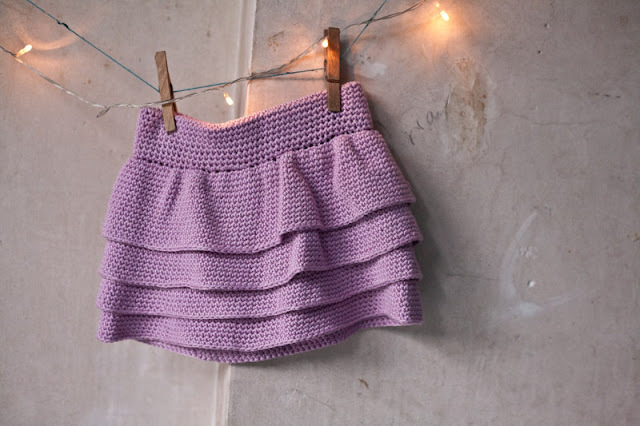 It's everything I expected after following your blog for the last few years - lots of really cute patterns and lovely photography. Could you tell us about the process you go through when you are designing and how you get your inspiration? Aw, thanks!! I really don't have a set process for designing. For the books, I will be working towards a sample project list, but I am lucky and able to change things if a design isn't working. About half of the time, an idea just pops into my head and I figure out how to make it. The other half of the time, its really about hard work – looking at what has come before, what would work with the rest of the collection, the general balance of items and what colours will keep with the general palette. I spend a lot of time on the swatching stage and really think through how every piece of the project will come together. I usually start with some basic principles – I want designs to be largely seamless, they need to be at a beginner to intermediate level and they need to be exceedingly adorable – the rest just has to follow. I used to have to make everything before I wrote the pattern, but now I usually start with an excel spreadsheet and lay out the pattern and grading mathematically – which is quite funny as I once told my math teacher that I would never use Algebra in real life! I block sites like Pinterest and Ravelry when I am designing, as I don't want to be influenced by other designer's work, so I tend to look for ideas in real life. I have been known to follow people around town so I can get a closer look at their garments and spend ages in shops inspecting shoulder constructions. Which is your favourite pattern from the book and why is it your favourite? The hedgehogs are definitely my favourite. I was supposed to be making bear claws to go with the Beastie Feet pattern, but I simply could not muster the enthusiasm. I was looking in my yarn stash to see if I could get any inspiration from that and I noticed 2 balls of Jamieson's Spindrift from Shetland, left over from another project. In my previous life, I worked for one of Scotland's environmental bodies and one of their projects was the eradication of hedgehogs from the Scottish Isles. Well, I thought "Wouldn't it be funny if I made some hedgehogs out of Shetland wool?" and the hedgehog mittens were born. Even if I am the only one who gets the inside joke, it doesn't matter as they are just so deliciously cute in their own right. I admit that I often find it quite a struggle to stay on top of things at home, run the house, a husband and two kids! Crafting and writing a blog is my relief, my down-time. I don't really know how you managed to write the book/ design all those patterns while at the same time running your blog, your other projects, AND look after three young children. How do you manage to do it all? Is there a secret you can share with us? There is no secret — the last year has been brutal. 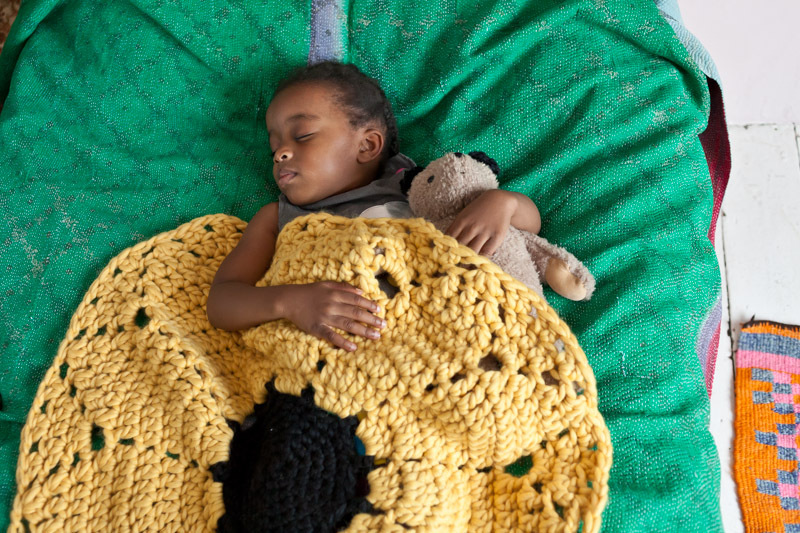 Last summer, at the peak of designing Crochet at Play, I had all 3 children at home, all day. Looking back, I don't know how we survived. We were able to just about keep everyone fed and clothed, but no housework was done and we did tag team parenting for months. We now have decided that sanity is vital for all of us and have invested in 3 full days of childcare a week. It still isn't enough time and I fill every crevice of time with work. My day often starts at 5am, working for a few hours before my husband goes off to work, working at soft play, at the park, at toddler group…in essence, I have become a huge bore!! For us, it comes down to what we prioritise – We value creativity and spending quality time with the kids over housework and grocery shopping. Laundry is piled 2 children high and I frequently forget to make dinner. Popcorn counts as one of your 5 a day, right? For many craft bloggers, getting a book published seems like an unobtainable dream. You've been quite open with your blog readers in admitting that it hasn't all been plain sailing. How long did the process take, what has it been like for you, and how do you feel now that the book is published? Crochet at Play was published almost exactly one year after I signed the contract. It is not an exaggeration to say it was thousands of hours of work – from sourcing yarn support, to grading and writing patterns, to making almost everything in the book. It is wonderful and fulfilling work, but very time consuming. There was a huge learning curve as well – I'd only designed hats before, so there was a lot of learning on the job about how to size and grade patterns, how to keep to a style sheet and how to design garments. I really have enjoyed it – I love throwing myself into one task, but have really found the juggling of kids, book writing and other work very hard. I also have worried a lot – that I have done things "the right way" and that people will like it. Now that it is out in the world, I am really proud of it. I set out to design a book of children's crochet that was whimsical and wearable – and looking at it now, I think I have done that. And while I had been so nervous about people making things in the book, seeing my designs on other people's children has been THE BEST THING EVER. In the acknowledgements you talked about people giving you the belief that what you have to offer is worth reading. I think many new designers and bloggers must feel this way (I know I do!) What advice would you give to anyone who has plenty of ideas but worries they may not have anything to offer which will be of interest to others? Hahaha, well, I still don't have it all together !! I think ultimately, you will never know if you don't try. I am a person who would rather regret what I do than all of the things I haven't done, so I just jumped in and made a commitment to doing the best I could and working to improve on areas where I struggled. It can take a long time to find your voice, but you will get there with time. And don't dismiss the importance of a great cheering squad. I have close friends, my mother and my husband who all act as sounding boards when I need help. I jokingly call them my "Dream Team" - from business advisors to my wonderful technical editor to people with style – I have an excellent resource of people who help keep me right. I am a terrible terrible worrier and at different points in the process they were all there to cheer me on or tell me when I have done something stupid. I think everyone needs people like that in their lives. Being creative makes you intensely vulnerable – and while ultimately it is a good thing, it helps to have people holding your hand and having your back when you need it. Sadly, no adult sized versions are planned, but I will be doing more designing for adults. Book 2 will contain patterns for the whole family and I have already started designing many of them. Plus, I am currently designing a range of designs for magazines and we are currently working on Issue 2 of The Crochet Project, plus its exciting new sister publication, out in January. 2013 is going to be busy, but I wouldn't have it any other way. 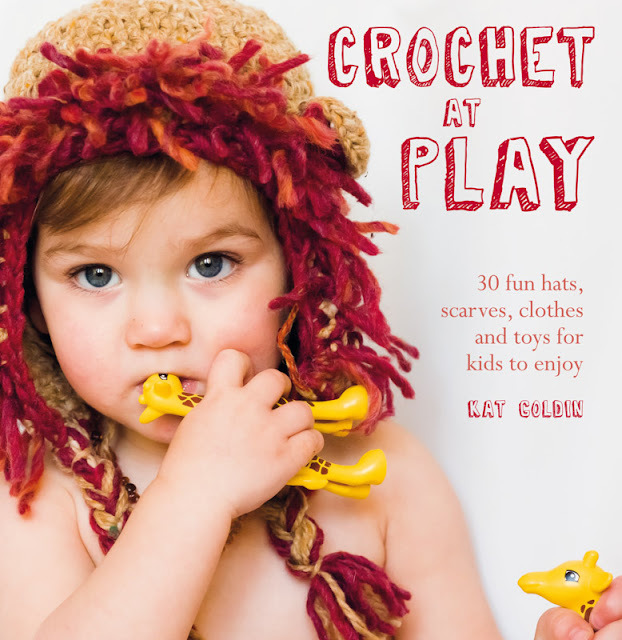 Kat has kindly offered a copy of 'Crochet at Play' for one lucky CftC reader. If that wasn't enough, she will also include the original (discontinued) yarn to make a lion hat! 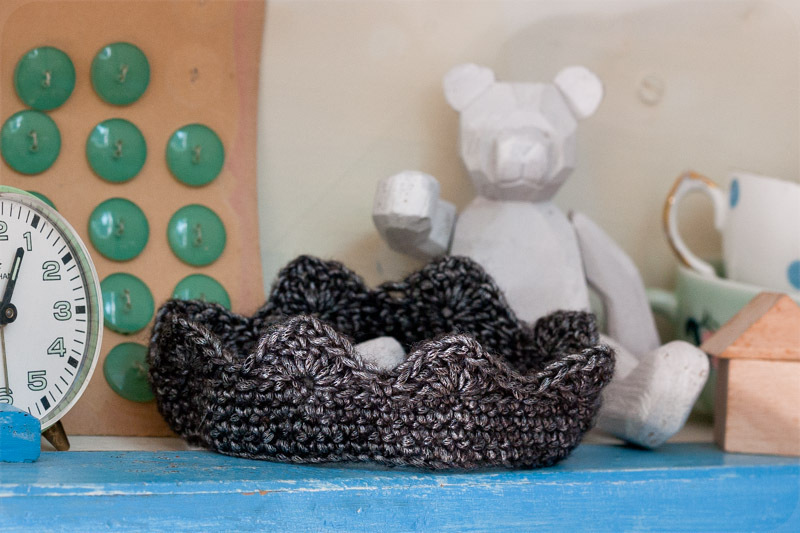 TO ENTER: Simply leave a comment below including an email address/Ravelry username. SUNDAY MAY 12th 2013. Entry is now closed! Wednesday 24th April – Natalie from Bambino Goodies —> read the review! The interview couldn't be more brilliant for the topic today! I see coming across both your blogs and work as the highlight of my Blogweek participation. Congratulations on securing the interview (kwtch) and the book (Kat)! Great interview, always like to read the background on how books etc come to life. I loved reading this interview, it's always interesting to see how others plan their time... or not, as is usually the case. I always seem to struggle to find time to do the things that I want to do. Many people have said that I must include some "me time " in every day, as I am as important as the washing and ironing! The older that I get the more logic I see in this. Perhaps we could all wear unironed clothes for one week! Such cute patterns. I love that mermaid tail! Stitched-Together on Rav. I'd be delighted to try out these great patterns as well as to enjoy Kat's fantastic photography! My ravelry username is skinghead and I hope to hear some good news! Cheers! Love the mermaid tail baby sack! Good luck with the book and the coming year's projects! Interesting post with you interview. Looks like a real nice book with fun patterns to try! Love this interview -- you ask such great questions, and Kat seems like a delight. PLUS: Merbaby! Really interesting interview - thank you. 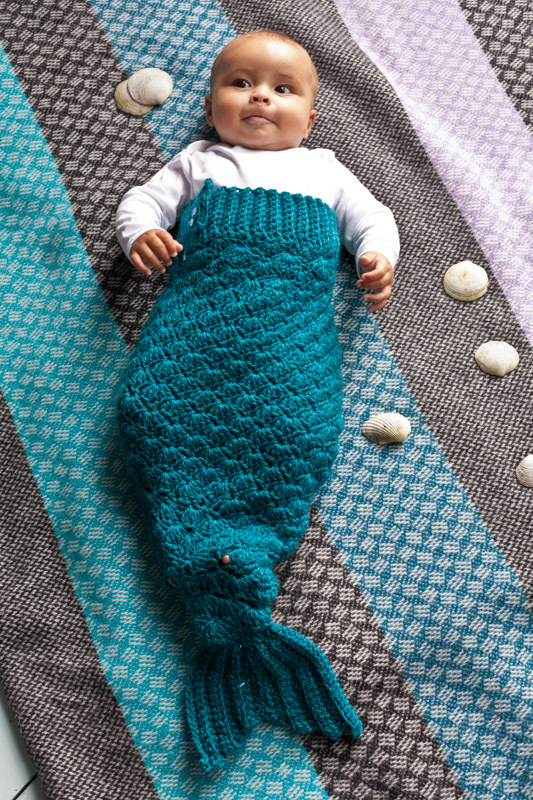 I also love the mermaid tail, now I just need a baby to knit for! Such a great interview. I have watched Kat's career blossom with interest and awe. It is both refreshing and totally daunting to hear her tell it like it is ... there's not getting away from it - thousands of hours of work. Oh, but what an amazing accomplishment!! She should be very very proud. Sister publication? My ears are pricked. Very interesting to discover just how much hard work goes into publishing a book of patterns. What a great interview, and her patterns make me wish I crocheted! That is a lovely interview, there are some lovely projects! You can find my ravelry through my blog :D thank you! A really lovely looking book :) It's good to be reminded just how much work goes into this sort of thing! What a great book! Thank you for the interview, I loved hearing how she manages her busy life. I feel a little better now about not getting round to all of the housework. I would love a chance to win the book, I am easterkate on Rav. Great interview, lovely looking book.. I'm sure I know 2 little girls that would love their Yia-Yia to crochet some of these projects..
What a lovely book! Thanks for the introduction to another wonderful craft blogger:) My e-mail is jodi.harper[at]gmail.com and my rav is joha123. Lovely giveaway :) - that lion hat is too cute! Love Kat's blog and I'd love to win her book. Thanks! What a fab giveaway! I would love a chance to win the book! What a great interview, it's so refreshing to hear someone be honest about the hard graft and the family/work balancing act.